My mother called early this morning. I hadn’t. 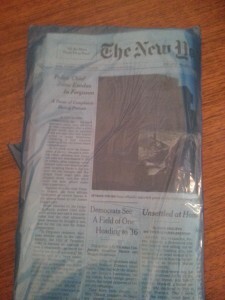 My paper was still in its delivery bag unopened. “There’s no Home section!” My mother speculated that her delivery guy had left it out of the bag – perhaps annoyed about his overdue tip. But a quick search online revealed the sad news. The New York Times has discontinued our longtime favorite section, Thursday’s Home section. The Home section has been one of the highlights of my week for years. I like Tuesday’s Science section but it’s so meaty it can take days to wade through and I sometimes view it with exasperation rather than anticipation since I know it’s likely to remain in my to-be-read pile for too long. Wednesday’s Food section is a bore – I just don’t care to read endless minutiae about food. And the huge two-part Arts section on Friday is usually tossed in the recycling bin after a glance at a review or two. But Thursday? Thursday was special. I pored over every article in the Home section, as did my mother. Home often prompted phone calls between us with critiques or comments about photos and articles. I woke up happy on Thursdays because I knew what awaited me in the bag outside my door. And I know we’re not alone in our love of the NYT Home section – for any house enthusiast Thursday’s paper was a much anticipated treat. Clearly the arts generate more advertising support than the home decor field. That’s too bad. It’s stupid and shortsighted on the part of advertisers – advertisements and snippets about products in the Home section have motivated my purchases multiple times over the years. But it’s also stupid and shortsighted on the NYT’s part. Daily delivery of the New York Times is not inexpensive and if the best sections are eliminated the expense becomes much more difficult to justify. Today’s a sad day for house enthusiasts and for newspapers. 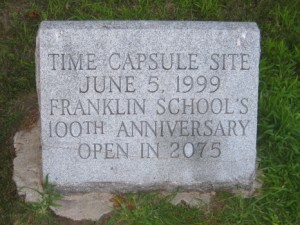 Time capsules have been in the local news recently as two time capsules were unearthed in Boston. First, a 113-year old time capsule was removed from the head of the lion statue at the Old State House. 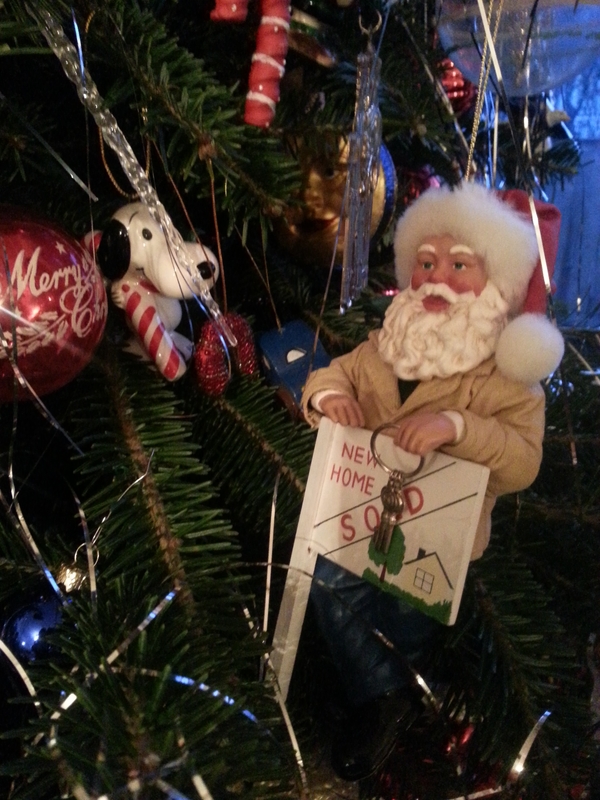 Then in December an even older time capsule saw the light of day at the State House. This one was first secreted away in 1795 though it was rehoused and reburied in 1855. First deposited by Paul Revere, William Scollay and Samuel Adams, the capsule’s contents should be fascinating since so much time has elapsed and its creators played such a large role in our history. Sometimes I think that time capsule creators don’t do that good a job of gathering evidence of their time. It’s difficult to decide what sums up an era – what will give people 100 or 200 years from now a real feel for our world. As a lover of old paper I’ve given this topic some thought over the years. Plenty of old paper I’ve got socked away brings back earlier times when I comb through the piles. For a time capsule perhaps a collection of essays in which people describe what they do in the course of a day would give a better sense of our lives. It’s the minutia of the day to day that will likely catch the fancy of people living in very different times. I’ve come across a couple of time capsules in Centers and Squares territory. The one pictured above is in Watertown Square. 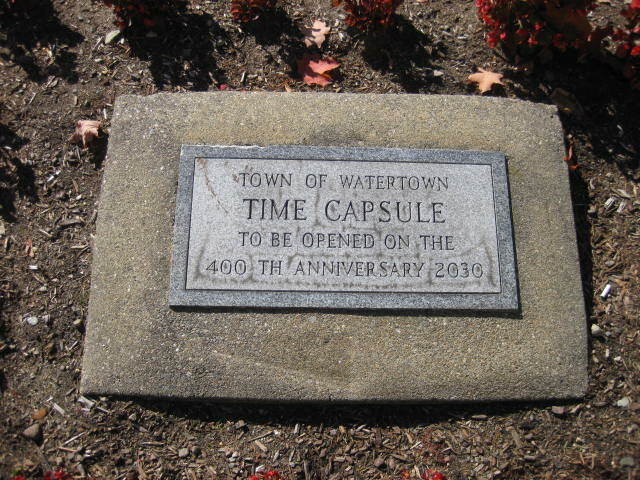 It’s due to be opened in 2030, when Watertown celebrates its 400th birthday. I’m not sure how old the time capsule will be at that point – we’ll just have to be surprised! And I’m destined to forever wonder what’s in the time capsule outside the Franklin School condos in Medford on Central Ave, pictured at right, since it’s scheduled to be opened in 2075. Tis a rainy, rainy Christmas. Best wishes for the happiest of holidays for you and yours. ReMax Destiny has been in the news lately. I’m delighted to report that the Boston Globe, for the second year, has named ReMax Destiny one of its “Top Places to Work“. ReMax offers real estate services in 80 countries but Remax offices are independently owned and operated so our two offices – in Cambridge and JP – landed us on the Small Employers list. We’re #6 on the list. ReMax Destiny is a great place to work and I’m very happy I made the decision to move my business here two years ago. We’ve got a super group of agents, a hard working and enthusiastic staff, and a broker, Paul Turcotte, who’s committed to staying ahead of the curve and ensuring we have all the tools necessary to provide top notch service to our clients. Employees chime in for the Top Places to Work honors but our other recent award was voted on by the community. In the Fall issue of Scout Cambridge that featured the “Best Of” award winners ReMax Destiny won for Best Real Estate Agent or Agency. Thanks to all who voted for us! We were in good company with many of my favorite Cambridge institutions garnering Best Of awards including the S & S, Pemberton Farms, Formaggios, and Porter Square Books. Congratulations to all. Have you noticed all the dead and dying trees? If you haven’t you’re not paying attention – and you’re not alone. Dead trees are everywhere. Many more are dying or not doing well at all. Few people seem aware of the problem however and there’s little information to be found about it. But drive around Massachusetts and you’re bound to spot dying and dead trees if you look. Anywhere you go – Cambridge, Somerville, Brookline, Concord, Winchester, New Hampshire – anywhere and everywhere you drive through. I started noticing them last year. I became a bit obsessed and would play the “dead tree game” wherever I drove. Passengers would initially be a bit taken aback as I called out “Dead tree!” over and over again, but eventually they too would join in. My obsession was lifted only when winter came and the lack of leaves made it impossible to distinguish the dead trees. Since the no-leaves season is fast approaching I urge you to be on the lookout now as you’re walking or driving around – you’re sure to see dead or unhealthy trees all around. One reason that few people seem to be aware of what’s happening is that the dead trees get cut down. I’d been planning to photograph the dead trees as evidence for some time but was finally motivated to do so after a particularly beautiful (but dead) tree that could be seen from Mass Ave disappeared. Already several dead trees in the slideshow have been removed. The photos I took for this slideshow, in August mind you when trees should be fully covered in green leaves, show trees in Cambridge with a few from Somerville, Medford and Watertown. Dead trees are everywhere in Cambridge – from Broadway to Brattle Street, from East Cambridge to West. Dead trees are in yards, parks, schoolgrounds, and everywhere lining the streets. We’ve lost almost all of the last few years’ investment in street trees as well as many of the much older and larger trees that line the city sidewalks. The trees you see here may very well be gone soon. Sadly there’ll be no shortage of subjects for next year’s slideshow as the dozens of very sick trees around town are likely to have died by next summer. When my father identified one dead tree as an elm I realized that several of the most striking dead trees were some of the few remaining elms in the area, long-time survivors felled not by Dutch Elm disease but by whatever’s killing Massachusetts trees now. I drove by a few of my favorites. There are three stately elms in a row on Main Street in Medford. One appears in very bad shape and the other two don’t look their best. I stopped by Manassas Street where a huge gorgeous elm stood on the corner for decades. It had been fine when I last worked around the corner at Coldwell Banker so I was stunned to see that only a stump remained. Other species that seem particularly hard hit are the copper beech and at least one type of maple. The glorious copper beech in front of the Cambridge Public Library is in terrible shape and can be seen in the slide show. You’ll see sickly maples everywhere with many bare branches and very small leaves. In many towns, in Massachusetts and NH, in yard after yard, some types of spruce trees were dead or dying. Oaks seem to be holding up better but when I walked past some of the majestic oaks along the Mystic River I realized that a number didn’t look well up close. So what’s killing the trees in Massachusetts and NH? I vote for drought and continued lack of water as a major cause. For at least the last two or three years, including this summer, we’ve been in a largely unacknowledged drought in the city. It was only last week that for the first time I heard a weatherman use the “d” word – until then the forecasters would simply celebrate the unending days of no rain. Even when rain was forecast, or when nearby towns got plenty of rain, the prevailing weather pattern meant that Cambridge area would get little or none. Trees often take years to succumb to drought and we can expect to continue to lose trees that are stressed from lack of water. Street trees are particularly vulnerable – I could have added many, many photos to the slideshow of young and not-so-young street trees that have died. In part, I blame this on the very small ground area around many of the trees making it even more difficult for them to get adequate water. But drive down Powderhouse Boulevard from Route 16 and you’ll see many dying or dead trees despite the grassy median they grow in. Young street trees need to be watered regularly and since they’re not it’s not too surprising (though it’s very frustrating) that they’ve succumbed. But older street trees are dying too. Over-salting is one reason that local trees near streets and highways are dying. Last winter I was mystified to see trees along Routes 2 and 16 that were totally white. Then I realized that they were coated in salt from top to bottom that had been made airborne by passing cars. Cities and towns need to cut back on the salt and everybody needs to buy snow tires, slow down, or stay off the roads when it’s stormy. Invasive pests are another important cause of tree death. Right now pests we’ve got to contend with include the emerald ash borer, woolly adelgid, and winter moth. Invasive vines are another tree killer. Many times I’ve come across trees that have a lot of greenery with dead branches sticking out at the top. Since many of Cambridge’s trees have had the new growth at the top die off, I’ve often mistaken these trees for ones where only the new branches are affected. Look more closely however, and you realize that the greenery is actually leaves on the vine that’s killed the tree and the tree itself is now a dead host. Some are suggesting that pollution is a major contributor to the tree die-off. Locally, people have suggested that some trees have succumbed to underground gas leaks from old gas pipes. Is this the first stage of a changing landscape due to climate change? Most of the potential causes listed above can be lumped together under climate change. It’s difficult to imagine what our towns and cities will look like when the local climate no longer supports the trees we know and love. As a homeowner, it’s difficult to know what types of trees to plant – what will thrive here decades from now? You can’t help but think that the wild weather we’ve experienced in the last few years is part of the changing climate. I’ve documented the downed trees from freak storms and microbursts more than once. The wild weather of a couple of weeks ago brought down more large trees locally – trees we really don’t have to spare. Why Should We Care About Tree Loss? I’m fully aware that not everyone is a fan of trees. I’ve had enough beautiful trees taken down near me by “tree haters” that I leap out of bed at any sound that suggests a chain saw is on the job. Some people see trees as a hassle – heaven forbid they have to rake – and others as a menace. Others value smooth pavement over driveway or sidewalk more than they do the tree. But it will be a sad place to live if we continue to lose trees at the current pace. And I’m afraid it’s a bit like the frog in the pot of water who fails to realize it’s getting hotter until too late. It’s easy to overlook how important the trees around us are until they’re gone. And then it will be decades before we can get back what we’ve lost. Much of it boils down (no pun intended Mr. Frog) to quality of life. Without a decent tree canopy it will be a lot hotter around here. Acres of asphalt baking in the sun without benefit of trees’ shade make for a miserable summer. And it’s not just the lack of sun and daylight that make people feel gloomier in the winter – it’s the lack of greenery. A bare tree’s branches are a thing of beauty but nothing beats the new green leaves of spring. Here’s a super article on the impact of trees on human health and happiness. Aesthetics are a huge part of trees’ value. There’s nothing more grim than a city street barren of trees. There are tree-less streets around here that are about as depressing a block as you’ll see. City greenery is one reason real estate tends to sell better in the spring – everything looks better when the leaves are back on the trees. Chances are almost any Cambridge street that you consider appealing is lined with trees. But perhaps not for long if something’s not done: one Avon Hill block I photographed had three or four huge trees reduced to stumps and several others dead or almost gone. Property values are absolutely impacted by trees or the lack of trees. My own street in Cambridge was described as a “tree-lined bower” some decades ago. That’s far from the case now as almost all of the trees have been lost and not replaced. I showed one real estate buyer a condo on my block and she turned up her nose and said “but there aren’t any trees on this street”. Needless to say, a sale was not made that day. Privacy is another benefit of our city trees that’s often overlooked until a tree is gone. Most of us would far rather have our views framed in leaves than be staring into our next door neighbor’s house. It’s easy to take for granted just how much a tree blocks from view. What Can Be Done About the Dying Trees? Water the trees for cripes sake! Whether it’s a tree in your yard, a tree in front of your house, or a tree outside your office – get a bucket and get watering. The trees need regular watering and need water as they head into winter. Consult an arborist about any distressed trees in your yard. I’ve got one of mine on a regular treatment plan for winter moths. I just wish I could get the raggedy, beleaguered street trees sprayed as well. Encourage the city to water the trees they plant. Trees need a great deal of water when they’re first transplanted. City trees never seem to get what they need. The lack of rain has exacerbated the problem resulting in the death of almost all the youngest trees. Can’t we give some kids a job for the summer? Talk to your representatives about using less salt or de-icer in the winter months. It’s better for trees and for local ponds, streams and lakes. Become better stewards of the tree canopy. It’s a mixed bag around here in terms of what towns and cities are doing to ensure a healthy tree canopy. Cambridge has hearings about cutting down street trees but I’m not sure it makes any difference. Far too many trees aren’t replaced. Brookline’s magnificent tree canopy puts Cambridge’s motley treescape to shame. What have they been doing right? 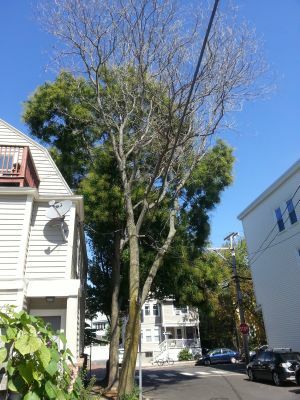 Medford calls itself a “Tree City” but its streets are often tree-free or what trees are there end up getting mutilated for overhead wires. Actually become a tree steward. Every year Massachusetts offers a two-day tree steward training. The training is held in a rural area but there’s also an emphasis on the health and maintenance of urban trees. Plant trees. Plant a tree in your yard or work with the city to get street trees planted or replanted on your block. It’s hard to know what trees will do well going forward. What will our climate be like 30, 40, 60 years from now? Recently it seems the newer oak trees the city planted seem to be doing well – their roots go down deep and they seem to do better finding enough water. Press for answers about the problem of dying trees. We need to start asking questions. It’s too easy to overlook the die-off of trees as the dead ones are cut down and lost from memory. Something’s happening though and we need to find out the causes before it’s too late. What’s Killing the Spruce Trees? I was window shopping on Charles Street on Beacon Hill a few days ago and spotted a flyer in a real estate office’s window. Seems that the office is marketing Beacon Hill garden shares for sale. 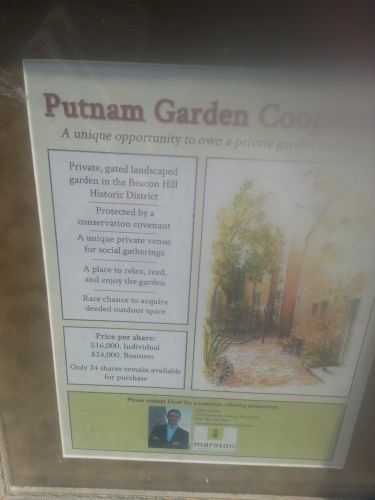 You can purchase a share in the garden, the Putnam Garden Coop, for just $16,000 (or $24,0000 if you’re a business). For urban dwellers outside space is a coveted amenity but this was a new one for me. It doesn’t appear to be an opportunity to garden similar to community garden plots around the city, but is instead meant to allow access to the garden for “social gatherings” and to “relax, read, and enjoy the garden”. If you’d just like to look, rather than buy, the Beacon Hill Garden Tour is scheduled for May 15, 2004. You can check out other upcoming tours on our updated Garden Tours page. Boston magazine’s real estate issue is always a sure sign that the spring market is here. 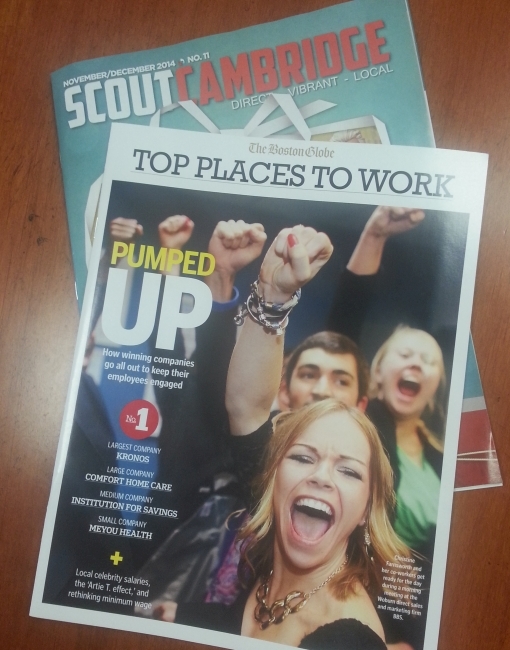 Real estate didn’t make Boston‘s cover this year but there’s plenty inside the March 2014 issue. 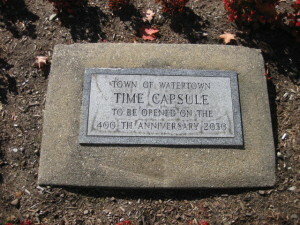 A couple of runner-ups are given in each category, and another town in the heart of Centers and Squares territory, Watertown, made the cut for “starting out”. I don’t think you need to be an empty nester to consider Newburyport. With its gorgeous housing stock, rich history and fabulous downtown it’s one of my favorite Massachusetts towns. I recently sold the Newburyport house pictured above. Built in 1720, remarkably intact and beautifully restored, it was the most fascinating house I’ve sold. Be sure to pick up a copy of Boston magazine’s real estate issue. It’s got tips for homebuyers, a fun piece titled “Embracing Plan B” with more affordable suggestions when your homebuying budget won’t suffice in the town you’re dreaming about, and a chart showing the one, five and ten-year change in home values for ~150 Massachusetts towns. Do you live in an old house? Chances are good that you do since so much of our local real estate was built before 1900. 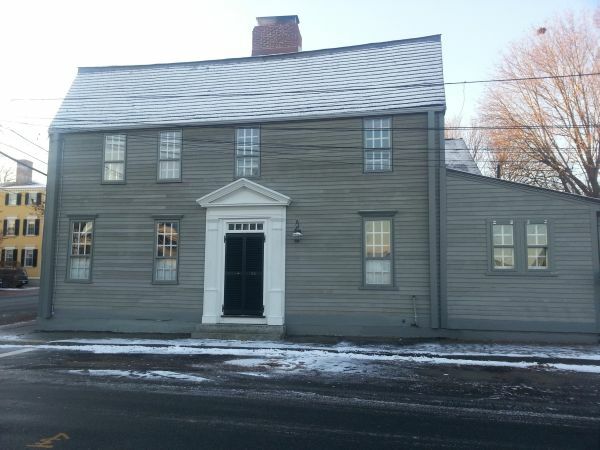 Old house owners should consider a Historic Homeowner membership with Historic New England. It’s one of several special interest membership categories and comes with a long list of member benefits. One that was invaluable for me was a historic paint color consultation done for my house by Historic New England’s Sally Zimmerman. Never would I have been able to choose those colors myself. One of my favorite Historic Homeowner member benefits is the opportunity to tour vintage houses with fellow members and Historic New England staff. It’s a super opportunity to see very interesting privately owned houses and to get a close-up look at architectural details and restoration work – completed or in progress. There’s nothing like seeing the houses first-hand in the company of fellow old house enthusiasts and old house experts. Last Fall, as a Historic Homeowner member, I had the opportunity to visit the Alanson Tucker House in Derry, NH, pictured above. It was an unforgettable experience. The house was built for Tucker, a successful merchant, in 1816 and the setting and the house retain an amazing amount of original detail. The owner, a Historic Homeowner member, is in the midst of a years-long painstaking restoration. It’s truly a case of a perfect match between house and homeowner. The owner’s deep knowledge of historic architecture means that he can read the telling details in the house that others might miss and can peel back layers added over the decades to reveal the house as it was almost 200 years ago. The last two weekends I’ve toured two more properties with fellow Historic Homeowner members – one in Boston and one in Cambridge. 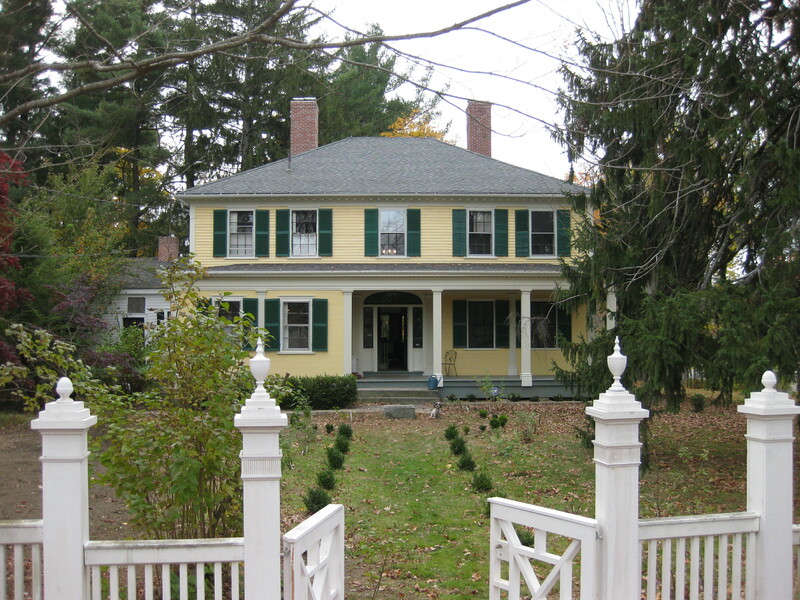 Both of the houses are protected by preservation easements held by Historic New England. 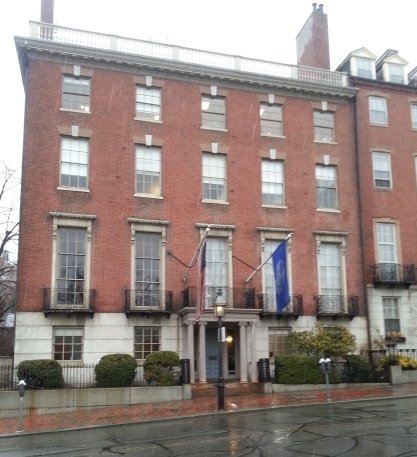 Across from the Boston Common we visited the headquarters of the American Meteorological Society on Beacon Street, pictured below. 45 Beacon Street is the third house in Boston that architect Charles Bulfinch designed for Harrison Gray Otis. Built in 1806 it is here that the Otis family lived the longest. The first Harrison Gray Otis house on Cambridge Street is the headquarters for Historic New England. The second, on Mount Vernon Street is a private home and Beacon Hill’s only freestanding single family. Our tour was fascinating on many levels – the house is extraordinary, we learned much about Otis, one of Boston’s early developers, and as the daughter of a lifelong weather buff I appreciated all of the weather-related tidbits too. Last weekend Historic Homeowner members were invited to tour a house built in North Cambridge in 1853 and restored by its long-time owner. The house is a blend of Greek Revival and Italianate styles and we toured it from top to bottom. It was a wonderful opportunity to see the architectural details up close with all sorts of insights shared by the homeowner and by Sally Zimmerman from Historic New England. My notes from our visit are filled with the names of companies and artisans who do quality restoration work of all sorts. This coming weekend we’re off to see another house in the stewardship easement program. It’s a very early house in Brookline, built in 1683. Don’t think that your house isn’t old enough for you to benefit from a Historic Homeowner membership. The program welcomes homeowners with more recently built vintage homes and previous member tours have featured mid-century modern houses. If you want to do right by your old house the Historic Homeowner program is an invaluable resource – and great fun too for old house enthusiasts.